A walk from Green Mountains via Binna Burra to Springbrook National Park. Passes massive stands of Antartic Beach, glorious lookouts and magic waterfalls. How do you get to the start of the walk? 2hrs south of Brisbane via Pacific Hwy exiting at Nerang.Then via Canungra up to O'reillys at Green Mountains. To leave a vehicle at the end take exit 69 at Nerang and then Nerang - Murwillumbah Rd to Springbrook turn off at Pine Ck rd. Which maps cover the area? Great Walks! Gold Coast hinterland Topographical Map. Day 1. Leave from O'Reillys and take Border Ranges track to Binna Burra. Day 2. 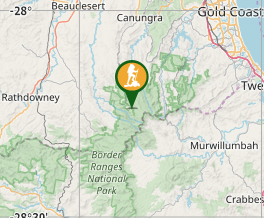 Binna Burra to Woonoongoora Walkers Camp. Today descends steeply to the Nerang River and Numimbah Valley. Day 3. Climbs steeply up to the Springbrook Range and then into Little Nerang Creek Valley. It then follows the valley up to the Purling Brook falls and passes behind these falls before winding up to the end of the walk. Do you need any permits? What's the cost? 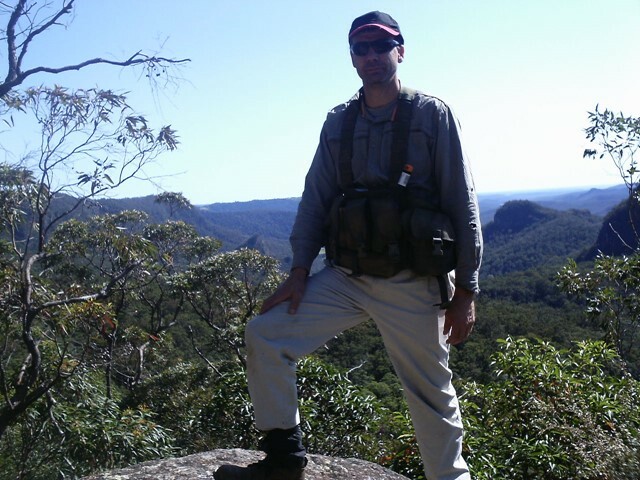 Need to book a private campsite at Binna Burra Ph: 1300 246 622 and a campsite at Woonongoora Walkers Camp with QPWS. This really is a great walk! It was first multi-day hike and perhaps a little ambitious, but definitely worth it. I recommend booking ahead for the Binna Burra accommodation during peak times as I tried a few weeks out from the long weekend with no luck. We ended up booking after a cancellation on the day. We got lucky the night at the Walkers camp - not another soul there. It was so peaceful. Be aware - we arrived at night time and the map at the walkers camp was misleading, it almost led us up the path more. The camp is directly straight ahead when walking past the toilets (with the toilets on the right). I would recommend taking water purifying tablets as there was no 'drinkable' water after Binna Burra. There is no water at the walkers camp so it's best to make the most of the creeks! Overall, (side from blisters and body ailments! ), this walk was really great and has definitely inspired me to do more. 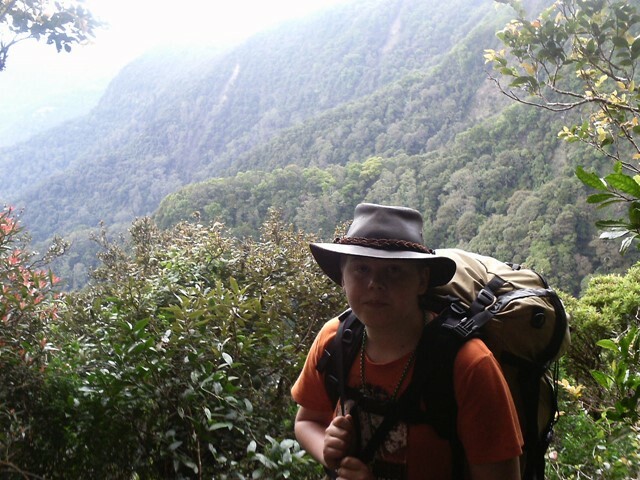 Just finished the 3 day walk as written from O'Reillys to Springbrook with 2 adults and a pretty fit and capable 7yo. On Day 1 the diversion up to Mt Merino on the border track is worth it in our opinion and only adds 800m or so on to your days total. We used this as our lunch break stop. Day 2 needs a few more notes - the section along the Nerang-Murwillumbah Road is pretty tedious and would be uncomfortably hot in summer I would expect. Make sure you have plenty of water as there is limited shade until you get to the village. The crossing across the Nerang river would have entailed wet shoes/feet (I suspect it has been washed away in a past flood) so we opted for a quick scurry across the road bridge - the road isn't that busy. You could buy lunch at the shop at Numinbah Village if you wanted to save some pack weight. We had lunch with us so walked past the shop to the hall and took a break under the trees in the park beside it (the public toilets are also here). There was water at the Woonoongoora Walkers camp and I suspect this is always the case as its the middle of a drought, the tank is tiny and the loos there need a little bit of water to keep them working. In any case, if you want to bring water with you as we did (and probably best to save disappointment and having to trek down and up the steep slope again), you can fill up at Waterfall Creek (use a filter or tablets as you prefer) and then lug it up the steep slope to the camp. Fantastic firefly display on dusk in the trees surrounding the campsite and plenty of pademelons as visitors in the evening. The 900 steps (a few less I suspect) on day 3 up to Apple tree Park weren't too bad if you have a reasonable level of fitness. We had Day 3 wrapped up in about 4.5hrs. You have to take the other half of the Purling Brook falls circuit to get up to Settlement Campground as the section highlighted on the map is currently closed. You won't get lost - there are loads of people trekking up and down this track to the falls for a swim - a very popular spot. Day 2 was tough with some steep fire trail downhills (keep going til you hit a great creek for lunch break) and long inclined road sections at the end. We were slow on this day and it took us 9 or so hours (long lunch break and stopping for fudge and ice cream heading into Numinbah Village added to the time) and so we arrived at Woonoongoora walkers’ camp after dark but trail was really well marked and no hassle to follow with bright head torches. Day 3 has heaps of stairs but the stroll through Springbrook following the creek was really lovely. Finished within the 5hr suggested walk time. Not recommended to walk in the height of summer, like we foolishly did! The section along the road walking into Numinbah was dangerously hot. All in all, a fantastic walk! I ended up having to complete this walk in two stages which was very frustrating due to incomplete information on the Great Walks NP page. Our car shuttle timings were completely off due to road closures that weren't posted on the great walks page which meant we were too late in the day to do the border track on day 1. Days 2 and 3 went smoothly even though again track closures at the end meant a longer walk back to the car and even more stairs. I did enjoy the walk a lot though and when we finally did the border track in January 2019 I felt like I had done the walk. Day two is very long and tiring but the walkers camp was lovely and we had it all to ourselves which was extra special. I loved the 3rd day and didn't mind the stairs at all. I did the green mountains section (Binna Bunna to O'Reilleys and back) over 2 days. Nice hike - flat and nice views. Great Walk! Did this with my 11 year old son and a mate. Day 2 was the toughest for my son. Great views, spectacular waterfalls, beautiful scenery.